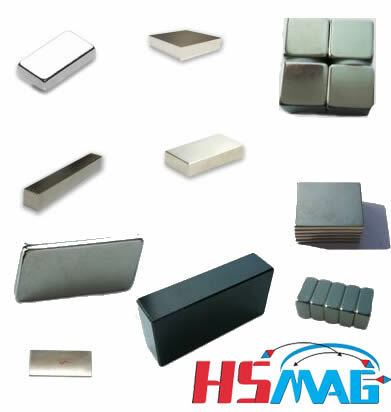 HSMAG offers neodymium magnets in square and rectangular block shaped. These neodymium iron boron magnets are widely used for motor, sensor and holding applications. As usual, we call them magnetic blocks, rectangular neodymium magnets, magnet blocks or neodymium bar magnets, their basic geometric shape is a rectangle. Magnetic blocks are always used in industry or labs, sometime the small magnetic blocks may be used as craft magnets for many hours of enjoyment. • HSMAG Neodymium block magnets are magnetized through the thickness. Rare Earth block rectangle magnets (Neodymium) are among the most powerful permanent magnets available. Our range is suited to a wide range of applications, including magnetic separators in the food industry, flow control systems and water conditioning to name but a few. The multi-purpose Rare Earth blocks are the number one magnet of choice due to the power of today’s magnetic alloys. Our neodymium block magnets, also called rare earth block magnets, are offered in several sizes, shapes and grades. They are the best alternative if you require a multipurpose magnet with maximum magnetic strength. HS Magnetics neo blocks are used in many different industries such as design, advertising, engineering, manufacturing, printing, film, science, construction, as well as for multiple commercial and industrial applications. If you require any advice regarding our rare earth neodymium block magnet please contact our sales team.